On Saturday (Dec. 4) at 1 p.m., the Meadowlands Environment Center is presenting "Animals in Winter," a presentation featuring live animals provided by Pat's Pals Animal Education. Learn about hibernation, migration and adaptation. $5/person; $4/MEC members. On Monday, Dec. 20, at 11:30 p.m., the William D. McDowell Observatory is hosting a special event — a total lunar eclipse viewing session. The first total lunar eclipse in nearly three years will take place on Dec. 20/21. Join MEC staff and receive a brief introduction to eclipses, learn about the lore/legends of astronomy and view objects in the nights sky while we gather to witness this astronomical event. Admission is free, no registration required. Participants will gather at the NJMC Center for Environmental and Scientific Education, adjacent to the William D. McDowell Observatory. This event is weather dependent and will be canceled if the skies are cloudy. Please check the main number 201-460-8300, on the night of Dec. 21 for weather updates. Wondering what might be seen in the Meadowlands this month? We thought we'd look ahead by looking back. The Northern Shrike, by the way, was first seen on Dec. 11. 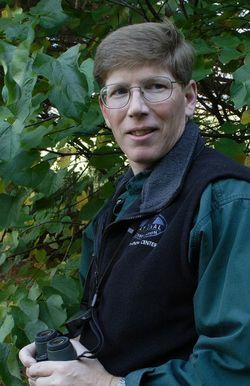 Don't forget: Prize-winning nature author Scott Weidensaul is giving a free talk, “Against All Odds – Miracles of Bird Migration,” at 7:30 p.m. on Monday in DeKorte Park, Lyndhurst. The talk, hosted by N.J. MC and sponsored by the Bergen County Audubon Society, will take place in the Meadowlands Environment Center auditorium. To read a profile of Weidensaul in The South Bergenite, click here. 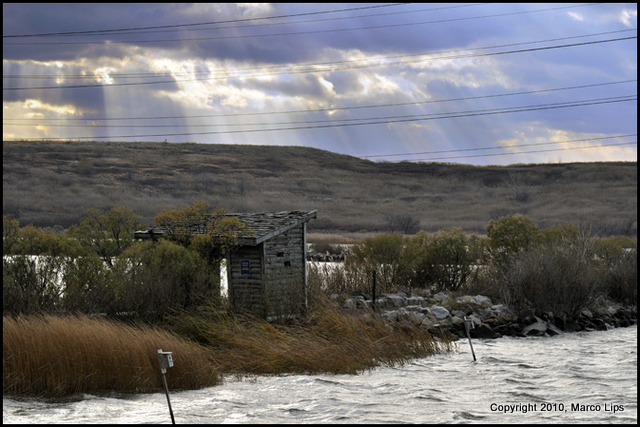 It may be hard to believe, but the old landfills of the Meadowlands have become major rest stops for migratory birds. Mike Newhouse, an NJMC naturalist, has led a bird-banding project in North Arlington for three autumns and springs to see how these birds use the habitats that emerge on the inactive landfills. 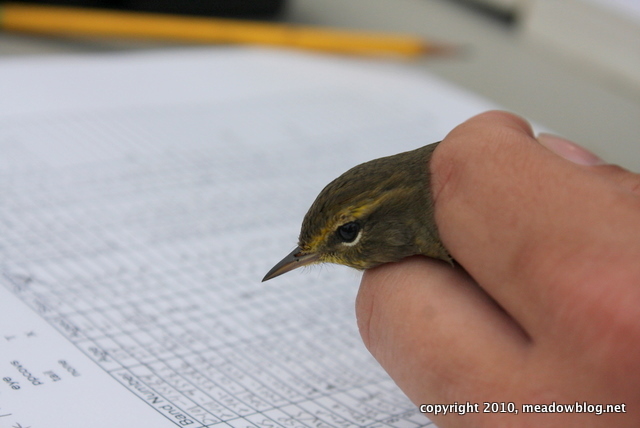 Using large stationary nets, Mike and his crew of volunteers briefly captured a total of 3,169 birds and 77 species over two months. 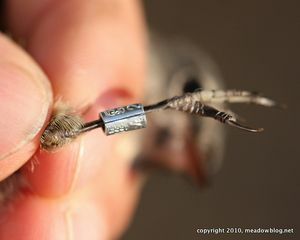 They then gently weighed, measured and placed a tiny leg band on each bird before setting it free. The most frequently banded bird: the Song Sparrow, at 484. The Yellow-rumped Warbler was close behind, at 465. I caught up with Mike recently for an interview. Full interview and photo of Mike at work follow.